The marketing world has its own set of vices and virtues. Therefore the businesses have to be extra careful while planning their marketing efforts. Just one step on the vicious path and you will be sucked into a whirlpool. In no time, your business will be pulled down by the negative forces. It is difficult, nearly impossible, to break free from these cycles, as one step automatically leads to the other. The magnitude of harm increases with each repitition of the cycle. The only way you can escape getting trapped in one, is by avoiding it. 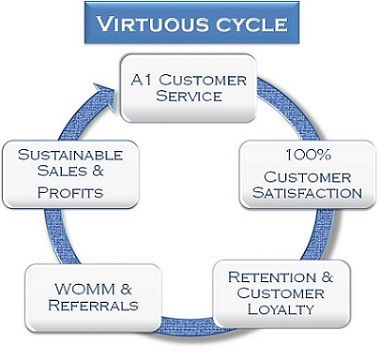 The business has to be extra cautious and ensure that its very first step initiates them into the virtuous cycle. And once in this cycle, minimal marketing effort will bring huge returns. A virtuous cycle, just like a vicious one, is also self- sustaining and becomes more impactful with each repitition. At A1 Call center, we provide a springboard for marketing department with our customer service support. Our qualified and well-trained customer care executives handle all the customer complaints with dexterity and promptness. This naturally leads to a delightful experience, which they tend to share. And your business begins to benefit from word-of-mouth-marketing (WOMM) and the customer base is ever expanding. On the other hand, some businesses scrimp on their call center expenditure and hire a sub-standard vendor. And they end up paying much more in the longer run, much more than what they thought they saved! 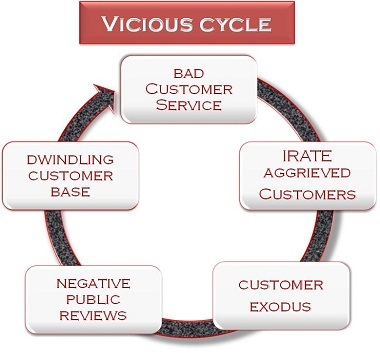 With each customer who gets pissed off because of a shoddy customer service, there is a loss of revenue to the business. The single customer dissuades other potential buyers by giving negative feedback on various consumer forums. So this indeed is the most crucial marketing choice, that whether you prefer the cycle of virtue or of vice? Posted in Call Center and tagged customer care support, Customer Retention, customer satisfaction.